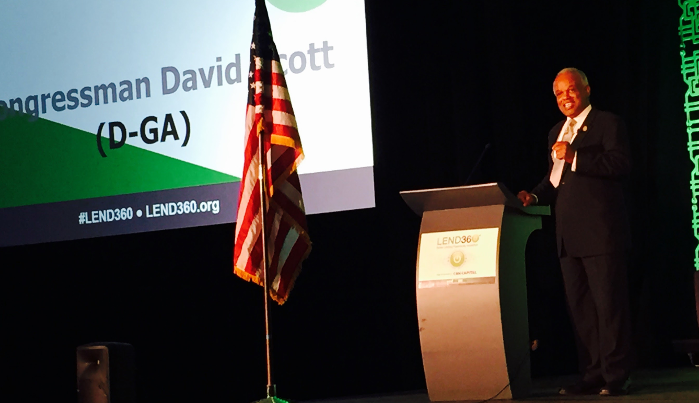 “God bless the online lenders,” said Democratic congressman David Scott while addressing an enormous crowd at Lend360 in Atlanta on Wednesday. Scott kicked off the morning’s events by offering a plan of action for online lenders. “Your industry is faced with some enormous challenges,” he said. Among those challenges is the aftermath of Operation Choke Point and the Consumer Financial Protection Bureau. On Choke Point, Scott said that the government saw themselves as coming to the rescue after the Four Oaks Bank fraud case. A theme of his speech was that the onus is on the online lenders to make sure the Department of Justice and other regulators don’t overreact to problems. “You’ve got to raise the issue because when you do nothing, something bad happens to you,” Scott rallied the crowd. He pointed out that a large percentage of the population is unbanked or underbanked and that we’ve got to make sure that people and small businesses have access to loans. Attorney Tom Sullivan immediately followed Scott and introduced the Coalition for Responsible Business Finance (CRBF), an advocacy and education platform for those that provide alternative capital for small businesses. CRBF was created to educate state and federal policymakers, media, and communities on how technology and innovation are providing small businesses access to capital that is necessary for growth. On a panel later in the day, Sullivan told attendees that a best practices framework can be used as a template for a law or guidance for regulators and that such a framework should be specific and not overgeneralize. Take the theoretical and apply it to an actual lending transaction, he said. The general consensus at the conference was that an intelligent proactive approach with policymakers was the best course of action for the industry going forward. Congressman Scott communicated that while the federal government might have good intentions, it definitely helps if there’s a strong voice available to tell their side of an issue. God bless America and God bless the online lenders.